The last few decades has dramatically changed our knowledge about the dangers that near earth objects (NEOs) like asteroids and comets pose to our planet. The system that was created to monitor nuclear explosions has revealed that asteroid, bolide and meteor impacts are on the order of four to ten times more common than we previous thought. Each day 100 tons of space debris descends on Earth, or about 40,000 tons a year of space dust and particles settle to ground. If we look up at night we can see to rather constant bombardment. The Leonid, Perseid, Lyrid, Cetid, Centaurid,Taurid, and the Orionid meteor showers are among the best known, but there are dozens more. Fortunately the dust, the particles and even the meteors of small size burn up in the atmosphere, and descent only as ash or small rocks. But larger space rocks are a true danger. Unispace III was held in Vienna, Austria in 1999 to address the subject of catastrophic asteroid strikes in some detail. At that time, the Conference ratified the so-called Torino Scale that set up a 1 to 10 rating system that maxed out at a very unlikely catastrophic level of an asteroid like the one that killed the dinosaurs and like the Richter scale for earthquakes gave us a simple way of sorting out likelihoods of NEO strikes. A “1” is something that will likely occur every few years but does comparative little damage, while a “10” is highly unlikely over time but is threatening to human survival. This asteroid hazard index is for popular understanding of these threats, scientists use a more sophisticated and information intensive rating system that is called the Palermo scale. The Unispace III Conference also approved Recommendation 14: “”Improve the international coordination of activities related to near-Earth objects”. As a consequence of this recommendation the UN Committee on the Peaceful Uses of Outer Space (COPUOS) created Action Team 14 to follow up on this recommendation. This international group met and eventually agreed to back the creation of two groups that was endorsed by the COPUOS plenary session and then by the UN General Assembly in December 2013. These two units that are now established are a U.N. International Asteroid Warning Network (IAWN) to coordinate information on NEO threats, and a Space Mission Planning Advisory Group (SMPAG) that is to consider any and all detected threats and devise a suggest defensive strategy to deflect or eliminate such an impending asteroid or comet strike. Some near Earth objects may pose a threat of collision with the planet (Credits: Secure World Foundation). 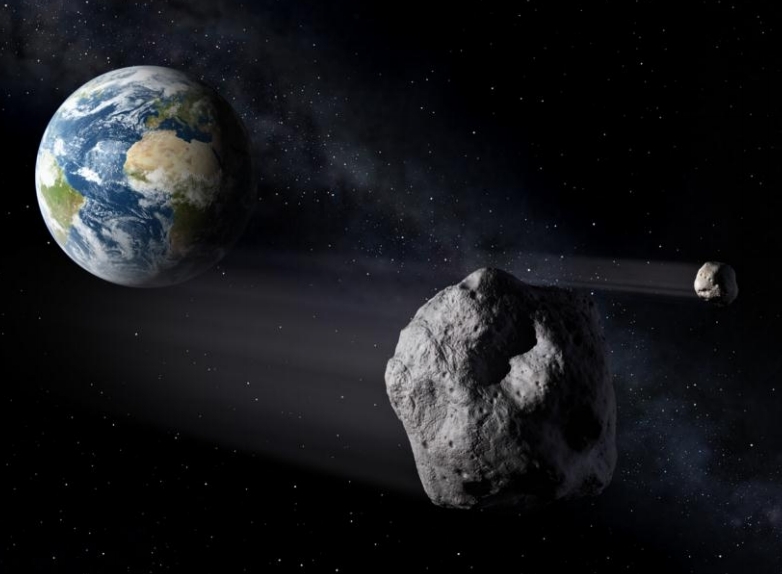 When NASA and the U.S. Congress took up the possibility of an asteroid impact, they first asked NASA to survey the skies via Infrared telescope satellites and ground observatories to find all asteroids that were 1 kilometer in size and were in orbits that could collide with Earth. After this survey was initiated, NASA and other scientific counsel suggested that just finding asteroids of 1 kilometers or larger in diameter was really not sufficient. In 2005 the figure that the U.S. Congress fixed for the NASA survey was reduced to 140 meters, and the potentially hazardous zone was set at 0.05 astronomical units (or within 7.5 million kilometers of Earth orbit). This Congress enacted within the 2005 NASA Authorization Act (also known as the George E. Brown, Jr. Near-Earth Object Survey Act, Public Law 109-155. Title III, Section 321), formally requiring NASA to report each subsequent year on progress being made on the survey and on strategies for responding to any detected threats. To respond to these Congressional imposed requirements, NASA re-purposed the Wide-field Infra-red Survey Explorer (WISE) that had almost completed its initial mission and renamed in NEOWISE (for Near Earth Orbit Wide-field Infrared Survey Explorer. The NEOWISE produced good results, along a number of ground observatories such as the MIT Linear System, Space Watch, the Catalina observatory, LONEOS, and NEAT that represent some of the key observatories that seek to identify and track potentially hazardous NEOS. NASA efforts, plus those of the ground observatories, and the world wide activities to track dangerous NEOs known as Safeguard (in honor of the name given by Arthur C. Clarke in Rendezvous with Rama to such an activity) have now identified over 90% of potentially hazardous asteroids greater than 1 kilometer. This is good news! What is not so good is that we still have a good way to go to find the 140 meter and above potentially hazardous asteroids. Even worse, many scientists and astronauts have suggested that 140 meters is the wrong cut off numbers for the search of deadly asteroids. In particular the B612 Foundation, founded by Astronaut Rusty Schweickart and now headed by Astronaut Ed Lu, has proposed that we should launch an infrared telescope that would be able to help us identify the 500,000 to a million potentially hazardous asteroids that are in the 30 to 40 meters in diameter in size. Schweickart and Lu are seeking the full funding for a $400 million spacecraft known as “Sentinel” that would do just that. B612 Foundation President Ed Lu explains how their system could track these much more numerous and yet highly dangerous asteroids with a precision that would identify their orbits for a hundred years to come. The B612 Foundation explains that a 30 meter space rock weighing millions of kilograms and with a relative velocity to Earth of perhaps 100 million kilometers an hour (or more) would have the kinectic energy of an atomic bomb. (Note: The unexpected bus sized asteroid that burst over Siberia in January 2014 for instance was about 17 meters in diameter) They also note that NASA proposed IR telescope know as NEOCAM (i.e. Near Earth Object Camera) would serve to meet Congressional defined tracking limits would not reveal a vast horde of “city killer space rocks” that might range up to a million in number. 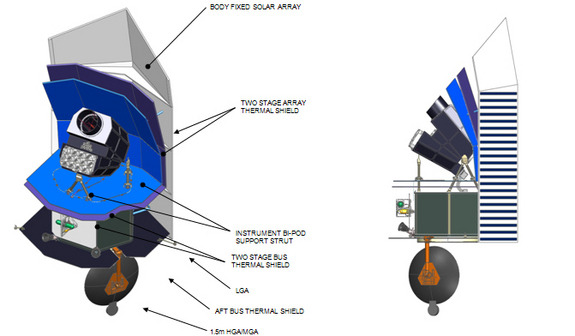 The B612 Foundation has the Sentinel IR Telescope under contract with Ball Aerospace and has raised half the needed funds to launch it in 2016 or so. This project which Ed Lu notes is about the cost of a freeway interchange system in a large US city could alert us to hundreds of thousands of potentially city killing asteroids. Clearly this is something that the US and other nations should consider actively supporting to help alert us to possible planetary danger. We also need to start working with the new Space Mission Program Advisory Group (SMPAG) to see what might be done to defend against a true cosmic hazard. The Planetary Society has an intriguing “Killer Bees” project that would use lasers to burn holes in asteroids to create “jets” to propel an asteroid away. Professor Philip Lubin is working on directed energy systems that could divert an asteroid so it is destroyed by the sun. If the danger is discovered to late, we might need to rely on nuclear weapons. The European Space Agency (ESA) and the German Space Agency (DLR)have started a small “NEOShield” research program to study defensive strategies. In short we need a better program of action to defend against cosmic hazards in the form of space rocks. First of all, detection programs such as the B612 Foundation need full support. Secondly, there needs to be serious study of what we would do if we found a potential “city killer” (or worse) headed our way and begin a serious study of a range of responses. ESA/DLR and the Planetary Society as well as University research studies could help point the way. I also believe we need to engage with the United Nation’s IAWN and the SMPAG and the world’s space agencies to ensure we have a competent planetary defense program put in place. Finally, the world space agencies should explicitly identify planetary defense as one of their critical missions. Programs to the Moon and Mars are great, but protection of our six sextillion ton mudball we call planet Earth should be job one.